The mother told deputies that the school contacted her just after 9:30 a.m. when her kids did not show up at class and she tried to contact them via cell phone. When they didn't answer she drove to their father's home and then called police when no one would answer the door. BOONE COUNTY, Ind. 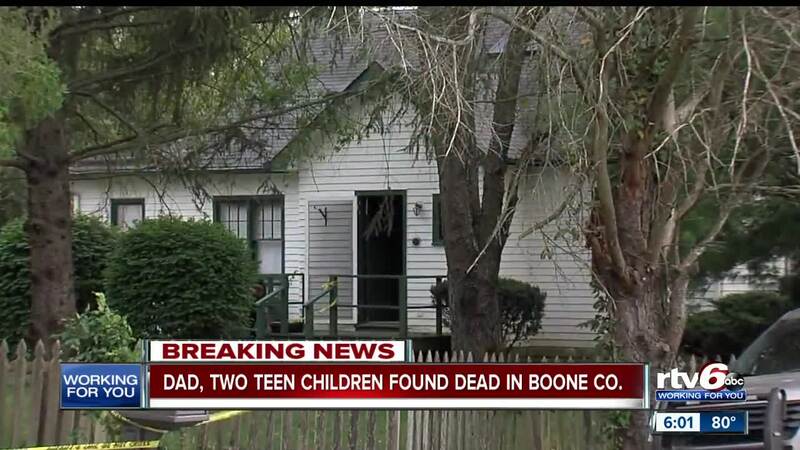 -- The Boone County Sheriff's Office is calling the death of a father and his two teen children Friday morning a double murder-suicide. The children's mother contacted the sheriff's office just after 10:30 a.m. for a welfare check after her two children, 15-year-old Harrison Hunn and 13-year-old Shelby Hunn didn't show up at school. The mother said both children were staying with their father, Michael Hunn, 50, at his home on County Road 900 East. Inside the home, deputies found Michael dead from an apparent self-inflicted gunshot wound. Harrison and Shelby were found dead in their bedrooms. Their deaths are being investigated as a double murder-suicide and deputies do not believe there is any danger to the public. "We all have faced yet another tragic event here in Boone County," the sheriff's office said in a statement released Friday afternoon. "Our hearts and prayers go out to all of the family, the community, Zionsville schools and the public safety personnel that responded." Zionsville Community Schools shared a statement regarding the deaths on their Facebook page Friday afternoon. You can read that statement below.